President Donald Trump urged Fox News to keep fighting to defend their top opinion talent, from organized boycotts targeting Jeanine Pirro and Tucker Carlson. Fox News did not air Pirro’s Saturday evening show after she questioned the patriotism of Democrat Rep. Ilhan Omar, a Muslim who wears a hijab. “Is her adherence to this Islamic doctrine indicative of her adherence to Shariah law, which in itself is antithetical to the United States Constitution?” Pirro asked on her show. The president blasted the “Fake News Media” for trying to cut down the top-rated conservative news channel. “The Radical Left Democrats, working closely with their beloved partner, the Fake News Media, is using every trick in the book to SILENCE a majority of our Country,” Trump wrote. 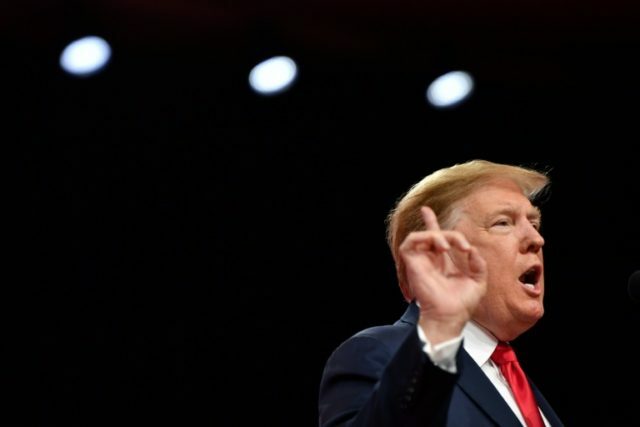 Trump commented on Fox’s programming after Fox News Sunday’s Chris Wallace accused the president of inciting white supremacists with his rhetoric, in an interview with White House Chief of Staff Mick Mulvaney. Trump said that Fox News should not try to be politically correct to silence their leftist establishment critics. “Fox must stay strong and fight back with vigor. Stop working soooo hard on being politically correct, which will only bring you down, and continue to fight for our Country,” he said.